In Predictive Control a model of the plant is used to predict the future evolution of the system. Based on this prediction, at each time step t a performance index is optimized under operating constraints with respect to a sequence of future input moves in order to best follow a given trajectory. The first of such optimal moves is the control action applied to the plant at time t At time t+1 a new optimization is solved over a shifted prediction horizon. Hybrid systems are heterogeneous systems that exhibit both continuous and discrete dynamics. A typical example would be a continuous system interacting with a controller that involves some logic components. Hybrid systems are ubiquitous in industry. Usually controllers for hybrid systems are designed heuristically: the most common approach resorts to using tools developed for linear systems, patched with a collection of heuristic rules. A lengthy and expensive trial and error procedure is required in order to achieve satisfactory performance characteristics. 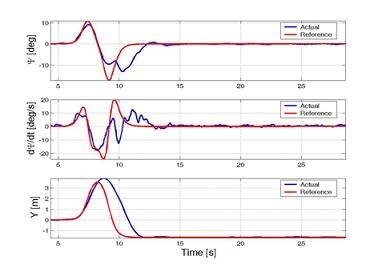 This research area considers the problem of computing the state feedback solution to predictive control problems for multivariable linear and hybrid systems and implementing it in real-time. We focus on the solution to finite time, infinite time and min-max optimal control problems with cost functions based on 2, 1 and ? norms. We have demonstrated that the solution to all these optimal control problems can be expressed as a piecewise affine state feedback law. Along with the analysis of the solution properties we have developed algorithms that efficiently compute the sate feedback optimal controllers. The results form a natural extension of the theory of the Linear Quadratic Regulator to constrained linear and hybrid systems. They also have important consequences for the implementation of predictive control laws. Precomputing offline the explicit piecewise affine feedback policy reduces the on-line computation for the predictive control law to a function evaluation, therefore avoiding the on-line solution of a mathematical program as is done in Model Predictive Control. Thus, this new technique has enlarged the scope of applicability of MPC to small-size/fast-sampling applications. Developing further the theory by focusing on robustness, estimation, tracking and min-max control. Computing low complexity stabilizing controllers for constrained linear and hybrid systems and trading off optimality for complexity in a systematic manner. Studying new methods for efficient on-line evaluation of the piecewise affine state feedback optimal control law.